With six years of being what some might call a professional patient under my belt, I embarked on my first year working on the flip side of that coin in a busy clinic with an underserved patient population. I was anything but idealistic; I knew it was not going to be easy, glamorous, or the romanticized version of medicine society force-feeds us. Unbeknownst to me at the time, I was still holding on to the blind idealism of my advocacy work, and I was confident that I could translate my ePatient skillset into patient care. At no point had I considered that my efforts could be lost in translation. While my professional aspirations flourished, my health slowly but surely deteriorated as I struggled to find the time to manage both my disease and my job. At my workplace, an understaffed outreach clinic with more residents than exam rooms and nurses combined, there was no such thing as sick days. Surgical procedures were frequently performed on the fly, without prior scheduling or notice, which meant that occasionally my own medical appointments fell by the wayside. There was no stepping out to make a phone call to my rheumatologist’s office to let them know I couldn’t make it; as a member of the medical team, I had to scrub in. I had to be fully present to care for someone else. My medical records from this particular office were riddled with this language: Patient denies X and patient states they did not begin X medication. How many times had I discussed — at length — my difficulty not just scheduling appointments, but following through with certain elements of the treatment plan due to financial constraints? Surely the fact that I made $8.50/hour and was unable to afford physical therapy (or more frequently, the specialty medications prescribed) didn’t make me noncompliant, did it? Did my doctor not care, not take me seriously? Was I not motivated enough? Why were these constraints not documented in my medical record? Why did my health record lack the socioeconomic and psychosocial context so intricately intertwined with my disease and behavior? The cost of my “nonadherence” was astronomical in that my disease activity skyrocketed; did I not effectively communicate that what I was unable to pay for with my bank account, I still paid for with my quality of life? More importantly, how many times had I documented those exact words — those seemingly innocuous phrases — in the medical records of my own patients without context? “Patient denies injection/procedure today, patient expressed understanding of risks involved, including…” How many times had I documented the word “adherence” in the same manner that my own adherence was called into question? Surely some of our own patients in disease communities far outside of my own had more complex circumstances — lower incomes, busy schedules — that had an impact on their ability to follow a treatment plan. After all, it was how I was trained, it was how my supervisors preferred things, and it was supposed to protect the practice legally. The medical record was for other healthcare professionals, I was told. It wasn’t supposed to include “superfluous” details. When patients were cloudy on the details during an initial appointment, they were often referred to as “poor historians.” During conversations with patients that were lengthy, empty verbal cues filled the growing space between us. Though my clinical skills strengthened, the patient advocacy I had strived so hard to bring to patient care each day felt lost and at odds with my work environment. My job was to keep my head down and keep charting, and I began to resent my own silence and participation in such a paternalistic hierarchy. In sharing these experiences anonymously online, I discovered an underbelly of the healthcare provider world — there were many others, ranging from physicians to researchers to medical assistants, often coexisting as professional patients, echoing these same sentiments. 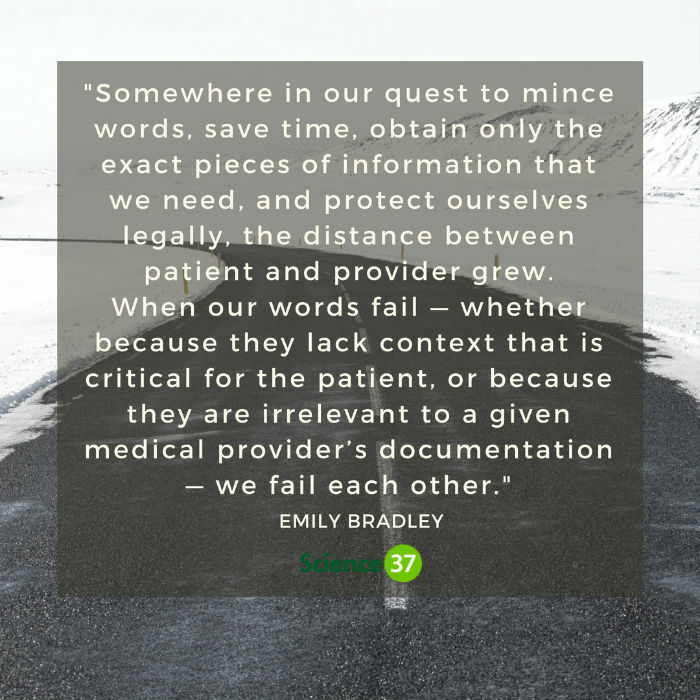 Somewhere in our quest to mince words, save time, obtain only the exact pieces of information that we need, and protect ourselves legally, the distance between patient and provider grew. These linguistic shortcomings are pervasive in every level of medicine, and when our words fail — whether because they lack context that is critical for the patient, or because they are irrelevant to a given medical provider’s documentation — we fail each other. Ultimately, these pitfalls will remain until we explore this conversation in the context of electronic health records (EHR), medicolegal implications, time constraints faced by providers, and the socioeconomic barriers to adequate healthcare that so many Americans face. Make no mistake, this conversation is not about assigning blame, and certainly patients have a stake in choosing their language carefully as well (which could be a series of posts in and of itself!). But perhaps, if we use a one-person-at-a-time approach to start taking that extra moment to verbalize or record — however briefly — the larger context, we can begin to close the chasm between the patient experience and the provider experience. Perhaps instead of “patient failed X treatment” we can begin with “X treatment failed for patient” or incorporate more phrases such as “patient elected to…” and “patient shared X regarding medication XYZ.” When our words fuel autonomy, so too does our practice. In the culture of precision medicine, patient-centered care, patient engagement, and participatory medicine, should we not take our practice beyond buzzwords? Should our words, phrasing, and communication not be precise as well? This is a wonderfully written, powerful article. I look forward to where you will take these ideas next. As a mom of a 23 yr old daughter w a rare disease i really understand where you are coming from here!